The finish line is in site. That means it's time to install a guest operating system on VMware Server. Read this tip for Andrew Kutz's instructions. Every machine needs an operating system, virtual or not. Luckily, installing the operating system is the easiest step of all in getting started with VMware Server. In this final part in our series on getting started with VMware Server on Windows, we'll look at installing the guest operating system and we'll draw some conclusions about the whole process of getting it set up. Previously, we walked through the entire process of getting VMware Server set up on Windows, including a study of the components, installation and configuration of Windows, security tweaks, installation of VMware Server and security tweaks to VMware Server. This is the easiest step of them all. For the purposes of this article, the guest operating system to be installed will be Windows Server 2003 Standard. If this is an OS that will be installed frequently in a VM, it may be worthwhile to create an ISO image of the install CD. A fantastic, free program for Windows called "dd" can create ISO images. Using an ISO image with VMware Server is very easy. The new VM that was just created should be selected in the VMware Server Console. If it is not, select it now. Click the "VM" menu item and then click on "Settings." 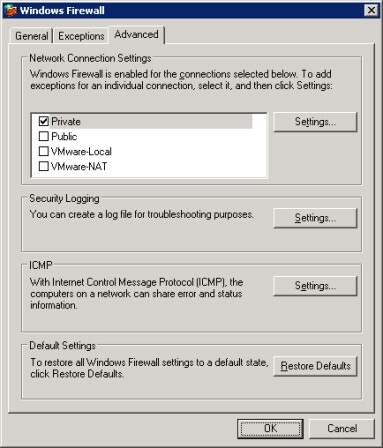 A new window titled "Virtual Machine Settings" will appear with a menu on the left listing the VM's devices. Select the "CD-ROM (IDE 1:0)" device. There is an option on the right labeled "Use ISO image." Selecting this option and then browsing for the ISO image is all that is required to use the ISO image. The VM will treat it as a CD that has been inserted into the CD-ROM drive. Once the install CD has been inserted or the ISO image mounted, it is time to power on the VM. The very first time a VM is powered on, the CD-ROM is the only device in the boot order, so any bootable CD or ISO image present to the VM will be booted. All subsequent times the VM is powered, the CD-ROM is not in the boot order (by default) and manual intervention is required to boot from a CD or ISO image. Just a little note that may prevent some frustration in the future. After the CD has booted, go ahead and install Windows as normal. After Windows has been installed, VMware Tools needs to be installed. VMware Tools consists of special drivers that know how to interact with VMware Server. Specifically, VMware Tools will allow the VM to have a better screen resolution and color depth, a faster (Gigabit) network connection, and intelligent memory management. VMware Tools provides other functionality as well, and to read all about it, be sure to check out the section on VMware Tools that starts on page 39 in the VMware Virtual Machine Guide for VMware Server. At some point, the following popup will probably appear. Click "OK." Go ahead and click on the "Finish" button on the VMware Tools installation window. Reboot the machine to complete the VMware Tools installation. These tips should help keep things running smoothly. 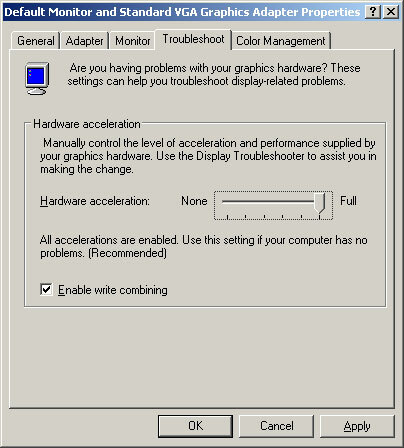 One way to improve the performance of a Windows guest is to disable CD-ROM polling. Windows checks for the presence of a new CD in the drive by constantly polling the CD-ROM device every few seconds. This can halt the host OS when a new CD is inserted and causes other slowness. To disable CD-ROM polling use the TweakUI program available from Microsoft's Website. VMware has a very nice guide for installing guest operating systems available here. The section on Microsoft Windows 2003 Server starts on page 31. If the server was configured with a dedicated management interface, the server firewall should probably be disabled on all other interfaces since those interfaces are used simply to proxy VM traffic. Open the Windows Firewall properties and click on the tab labeled "Advanced." Uncheck the box next to all of the network connections that are not the dedicated management interface. Now the only network interface that is firewalled is the private management interface, leaving the others open to give all traffic freely to the VMs. It is now safe to plug the ethernet cables back into the server's network interface ports. Users who need to connect to VMware Server in order to administer VMs can download the VMware Server Console from the MUI at https://%HOSTNAME%:8333/. There will be a dropdown list that contains the VMware Server Console versions for Windows and Linux. If this server is a member of an AD then a lot of the settings applied in this guide could be automated with Group Policy. Some of these settings include file security, event log locations, firewall policy, windows update policy and more. It was the goal of this series to provide a guide for system administrators in creating a secure deployment of VMware Server. If you have any questions feel free to e-mail me at akutz@lostcreations.com.